Announced last week, Disney will be rebooting its high profile animated series DuckTales in 2017 for its station Disney XD. Detailing the adventures of wealthy adventurer Scrooge McDuck and his grandnephews Huey, Dewey, and Louie as they span the globe (and beyond) looking for treasure, the series was hugely popular for its Disney Afternoon line-up in the late-1980s/early-1990s (so far as getting its own feature film, DuckTales the Movie: Treasure of the Lost Lamp, and spin-off in Darkwing Duck). 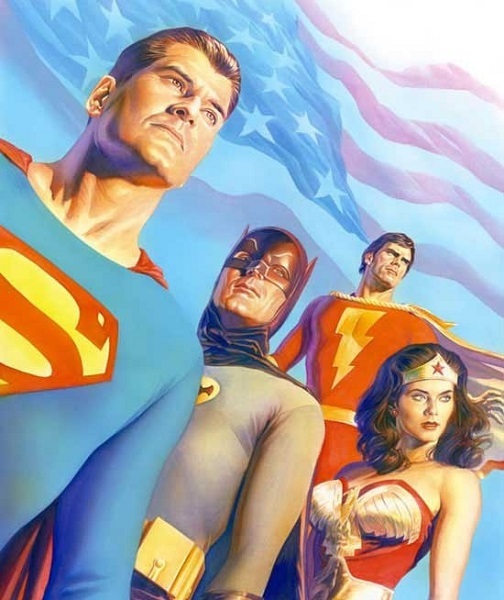 However, what many may not know, is that the series’ origins derives from comic books beginning in the Golden Age. Carl Barks, a rancher, cowboy, and drifter turned artist (via correspondence courses) became an in-between animator at Disney in 1935 until health problems caused him to quit in 1942. 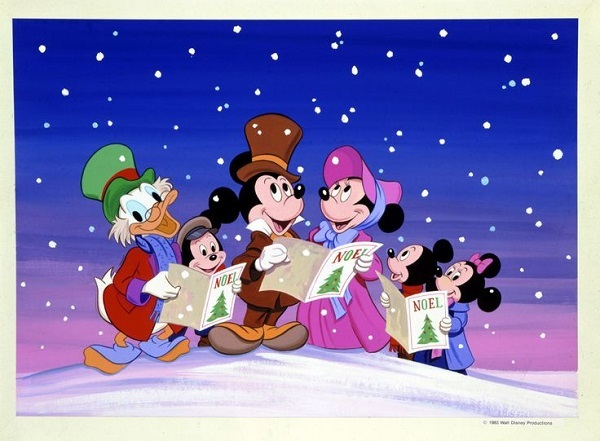 That same year, he migrated to comic book artist when he helped produce a Donald Duck story for Dell’s Four Color Comics called “Donald Duck Finds Pirate Gold.” The job led to Barks becoming the ongoing artist for Donald’s comic stories including one such fateful tale entitled “Christmas on Bear Mountain” five years later. While Donald Duck’s nephews Huey, Dewey, and Louie were introduced in 1937, the idea of Donald’s family was an area largely left unexplored. In what was intended a one-off story in 1947, another member of the Duck clan would be introduced in one Scrooge McDuck. Something of a mash-up of Ebenezer Scrooge (A Christmas Carol) and Charles Foster Kane (Citizen Kane), McDuck was a wealthy, bitter hermit living in a mansion atop Bear Mountain. Dreading Christmas, McDuck devised a way to entertain himself by inviting his nephew Donald to come visit so he could scare him by dressing up as a bear. However, when Donald and his nephews arrive, through a series of events they unknowingly bring real bears into the structure. By the time McDuck reveals himself dressed up as a bear, he finds his grandnephews chasing a bear cub and Donald fainted atop the cub’s sleeping mother. Believing Donald to be sleeping with a bear by choice and thus being fearless, McDuck decides to slip away again until the following day and spend Christmas with his family. Carl Barks decided the character opened new doors and could prove an interesting avenue for new stories, bringing him back the following year for “The Old Castle’s Secret.” The concept of McDuck recruiting Donald and his nephews to look for treasure started here when they joined together to seek a fortune hidden in Dismal Downs, the McDuck ancestral home. In the years that followed, McDuck evolved from a reoccurring character to a featured one (beginning with the seminal “Only a Poor Old Man”) as the likes of Gladstone Gander, Flintheart Glomgold, the Beagle Boys (who got their own spin-off comic in 1963), Goldie O’Gilt, the Junior Woodchucks, Gyro Gearloose, Emily Quackfaster (aka Miss Typefast and Mrs. Featherby), and Magica De Spell were introduced (and later adapted in DuckTales). In fact, in 1952, McDuck’s popularity spawned the comic series Uncle Scrooge. The popularity of Carl Barks and his Scrooge McDuck was said to have inspired the likes of Stephen Spielberg and George Lucas (specifically the boulder scene in Indiana Jones) and Osamu Tezuka, the father of Japanese comics and animation. Barks largely retired in 1967 (returning as a writer for Junior Woodchucks stories in the 1970s), oddly enough the same year McDuck made the leap to the big screen for the animated short Scrooge McDuck and Money. 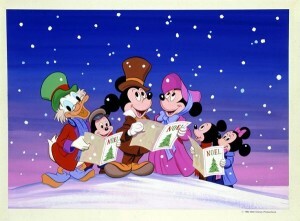 1983 would lead to a starring role for McDuck in Mickey’s Christmas Carol as his namesake Ebenezer Scrooge. A few years later, he would also emerge in Sport Goofy in Soccermania. Other creators would begin to tackle the character in printed form, such as Italian writer Romano Scarpa for the European market while Barks was still making McDuck stories in America. 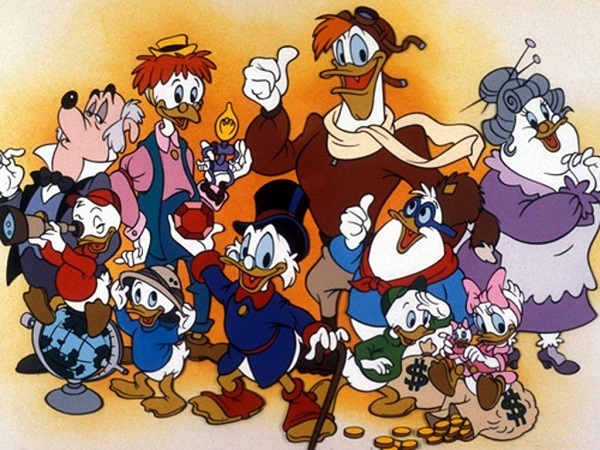 Scarpa would expand the McDuck universe with original characters like Brigitta MacBridge and Gideon McDuck as well as explore John D. Rockerduck and Fethry Duck. However, despite surviving Barks’ retirement, it wouldn’t be until 1987 that Scrooge McDuck found another creator to raise the bar again. “The Son of the Sun” published in 1987 in the series Uncle Scrooge featured the premier of Don Rosa to Scrooge McDuck. Having idolized Carl Barks growing up with McDuck his favorite comic character of all time, Rosa (who spent almost two decades as a cartoonist at this point) learned Gladstone Publishing had acquired the license to print Disney comics and called editor Byron Erickson. 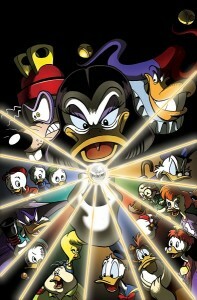 Telling Erickson he was the only American born to write and draw Scrooge McDuck, the editor decided to allow Rosa to submit a story for consideration resulting in “The Son of the Sun.” Centering around McDuck and his arch-rival Flintheart Glomgold, the story sees the pair seek out Incan treasure as Barks’ adventures with the characters are paid a high tribute. The story received widespread acclaim, a nomination for a Harvey Award, and made Rosa a major player in the Disney comic market, especially in regards to McDuck. Also in 1987, a spin-off series in Uncle Scrooge Adventures started being published. Uncle Scrooge continued past the expiration of Gladstone’s license in 1990, transitioning largely unchanged under the Disney Comics brand and survived the “Disney implosion” of 1991 (returning to Gladstone when they reacquired the license in 1993). 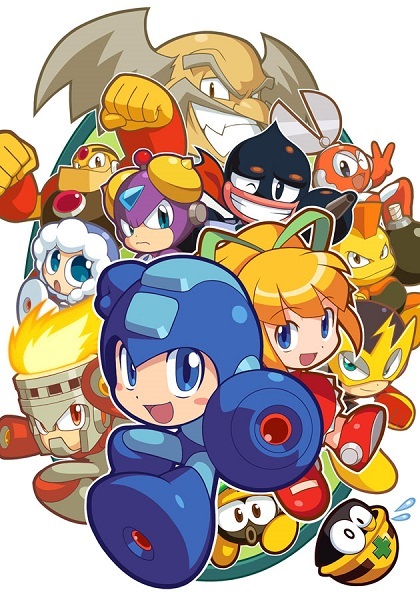 Sadly, Gladstone ended all publication in 1998 leaving the title without a home for the first time in almost half a century. For most of the published life of Scrooge McDuck, he was a printed character that on occasion transitioned to animation. However, only a few months after Don Rosa reinvigorated the character, McDuck made television history for the Disney company. Disney CEO Michael Eisner wanted to expand the company’s animation domain beyond shorts and films in order to tackle the growing television market. The initial offering were the series The Wuzzles and Disney’s Adventures of the Gummi Bears in 1985 but neither featured previously established Disney characters. This changed in 1987 with DuckTales. 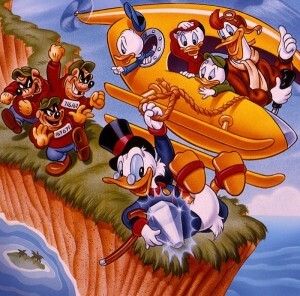 To an extent adapting Uncle Scrooge, DuckTales featured Scrooge McDuck and his grandnephews Huey, Dewey, and Louie however Donald Duck was substituted with pilot Launchpad McQuack (Donald, who was the caregiver of his nephews, had enlisted in the Navy and appeared occasionally in the series). The series began with the television movie “The Treasures of the Golden Suns” (which would subsequently be broken up into a five-part series of episodes) with the first season consisting of 65 episodes (the standard for syndication). 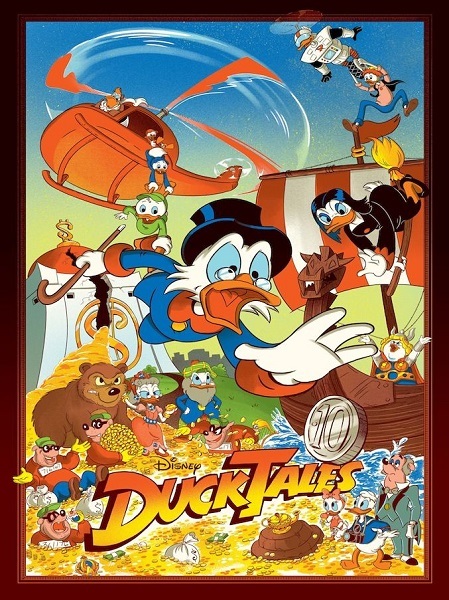 The second season followed shortly thereafter made up of two television specials in “Time Is Money” and “Super DuckTales” which would be broken up to make ten episodes. Returning again for a third season, the show proved so popular a feature film in DuckTales the Movie: Treasure of the Lost Lamp found its way to theaters. A fourth and final season emerged resulting in one hundred episodes, making DuckTales one of the longest running Disney television series by episode length. 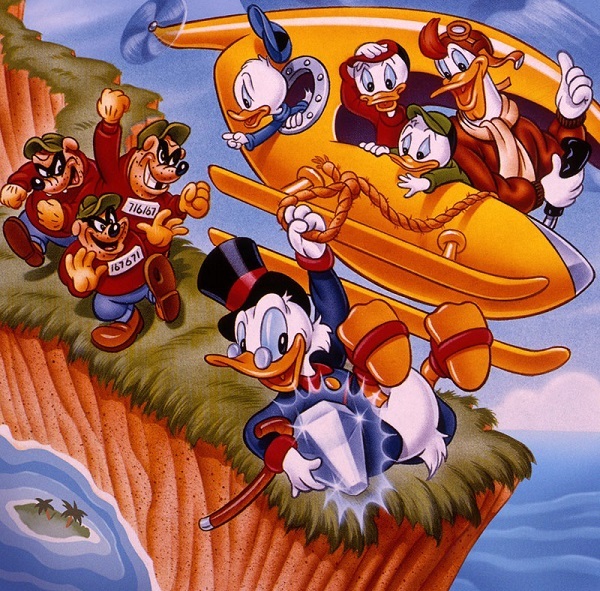 Its final season would also lay the foundation for the popular Disney Afternoon programming block alongside Gummi Bears, Chip ‘n Dale Rescue Rangers, and TaleSpin. The following year, a spin-off would emerge in Darkwing Duck, featuring a pulp-inspired costumed adventurer (in the style of the Shadow, Green Hornet, and Zorro) with Launchpad McQuack as his sidekick. Later, Gizmoduck (an armored hero inspired by the James Rhodes Iron Man) from DuckTales became a reoccurring character in Darkwing Duck. McDuck and McQuack would separately each make an appearance later in the series Raw Toonage. In comic books, it has become fairly common place for continuity to be slightly altered or radically changed. 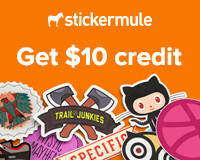 Scrooge McDuck proved to be no different. Over the years Carl Barks produced the character, changes were made over time tweaking the character, be it his design, history, or even attitude. Added to this mix, there was almost a separate continuity in Europe that at times seemed to interweave into the American counterpart (causing some small level of confusion). 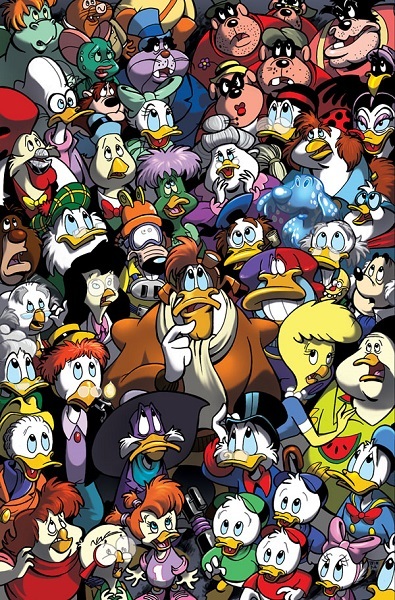 Add to all of this multiple creators working with McDuck following Barks’ retirement and the somewhat separate/somewhat integrated DuckTales continuity and the story of Scrooge McDuck was something of a mess. 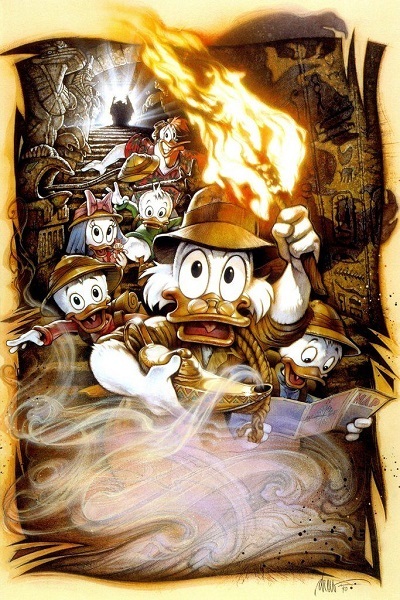 So, in 1994, Don Rosa embarked on an almost two year journey that largely took the continuity of Carl Barks, sheering away other interpretations, and creating a unified vision of what it seemed Scrooge McDuck was always meant to be starting from his origins to that fateful Christmas eve on Bear Mountain. 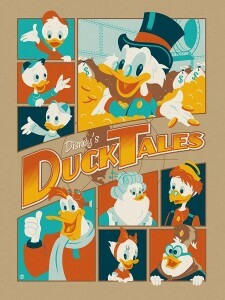 Entitled “The Life and Times of Scrooge McDuck,” thirteen issues of Uncle Scrooge chronicled Scrooge earning his first dime (known today as the Number One Dime) to his history with the Beagle Boys to his first meeting with Flintheart Glomgold to making his fortune to moving to Duckburg, Calisota to being introduced to his nephew Donald. The story is considered by many a masterpiece, earning Rosa the Will Eisner Award in 1997. Scrooge continued to be popular, so far as getting another series in The Adventurous Uncle Scrooge McDuck in 1998. However, that same year, Gladstone would fold. Despite the closure of Gladstone, there certainly seemed to remain a market for the content it produced. So, in 2003, Diamond Comic Distributors with the editorial staff from Gladstone came together to form Gemstone Publishing. In short order, the Disney license was acquired and Uncle Scrooge returned to circulation again maintaining the same numbering from when it passed from Dell Comics to Gladstone (issue 319 by the time it came to Gemstone). Sadly, by 2008, Gemstone had run its course. However, Boom! Studios quickly acquired the dropped Disney license and picked up Uncle Scrooge where Gemstone left off. Further, Boom! 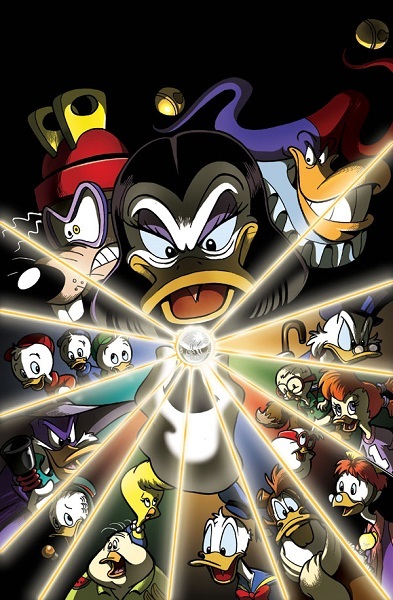 resurrected DuckTales and Darkwing Duck with their own series, the two books even crossing over with each other in “Dangerous Currency” when villains from both series aligned to conquer both Duckburg and Darkwing’s city St. Canard. 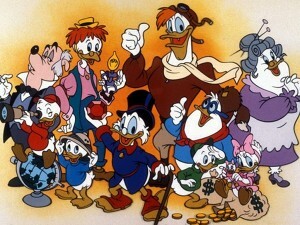 McDuck would also be featured in the original series Disney’s Hero Squad: Ultraheroes. Unfortunately, Boom!’s take on Disney was short-lived as Disney bought Marvel Comics in 2009 and consolidated its comic publications in-house. That being said, all of the Disney comics by Boom! came to an end (Marvel generally only tackling Pixar-related comics). A little over a month ago, it was announced IDW Publishing (who already licenses comics for Cartoon Network and Hasbro) secured a license to produce Disney comics and will publish a new Uncle Scrooge series beginning in April but for the first time in sixty-three years will abandon the original numbering.